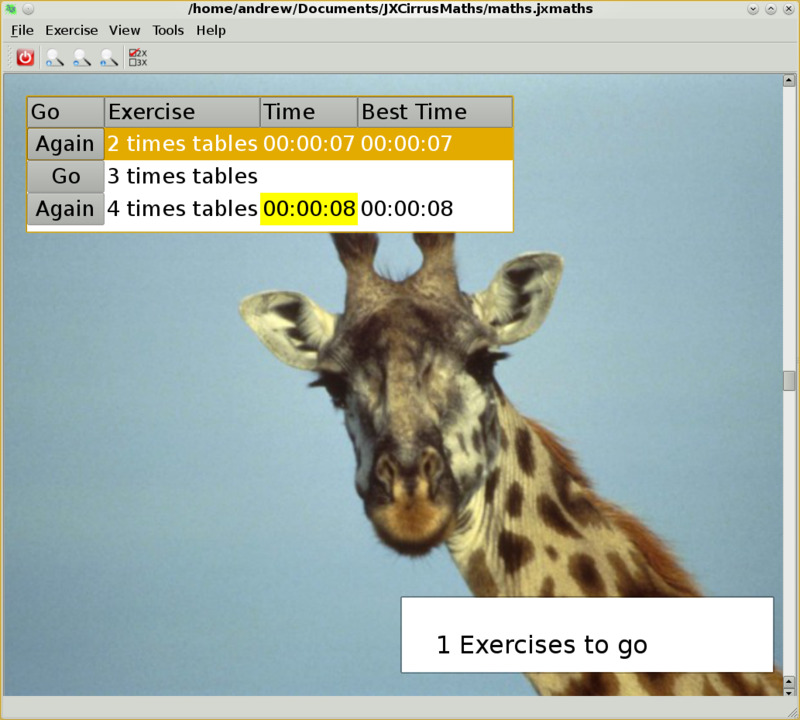 XCirrus Maths is a maths training application aimed at primary school children. It focuses on basic arithmetic: Times tables, addition, subtraction and division. It will let you set up exercises that are run each day, and then records the best time and lets you race against that. - Set up any number of exercises for your child. - For Times tables and division: Select one or more times tables to practice, choose how many questions will be asked, choose whether they will be run in random order. - For Addition and subtraction: Select a range to add up to or subtract from (i.e. add up to numbers between 15 and 25) and how many questions to be asked. - Schedule exercises to be run once a session, once a day or once a week. - Records the fastest time for an exercise. - Lets you race against your fastest time (which adds that extra bit of interest to maths practice). - Set up the application to display photos from the family album - The photo will change over after each completed exercise. - Set up exercises for any number of children. - Share exercises between computers using Cloud services like Box and Dropbox. - Available on Windows, MacOS and Linux. - Includes a built-in user manual. - Fixed an error where the app locked up mid-exercise.